So how do you review a coloring book? I’ve been kind of fascinated by the coloring book phenomenon going on in the publishing world. It would appear that an awful lot of people who grew up having spent some time coloring with crayons in coloring books have missed that relaxing exercise. Coloring books for adults have become a hot commodity lately and I decided I shouldn’t ignore it. I don’t know “The Witcher” but it looked to have a fantasy element to it that I would enjoy. It does, and I did. The Witcher is a role-playing video game, based on a novel series of the same name, by Andrzej Sapkowski. A Witcher is a monster-hunter who has supernatural powers. Each two-page spread features a quote from one of the characters in the series on one page, and a detailed black line drawing with plenty of white space for coloring on the opposite page. The quote and the picture don’t always go together in the strictest of senses, but the quotes and the art present a pretty good over-all idea of what it might be like to play this video game. Even more interesting is that because of this coloring book, I am now really interested in reading the book(s) by Sapkowski and I’d like to at least watch someone play the video game. Looking for a good book? 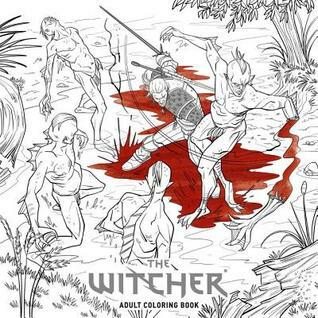 The Witcher Adult Coloring Book is a coloring book with really fine art in a fantasy setting, based on a book and video game and should inspire the kid-with-crayons in all of us.